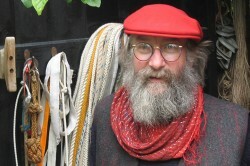 Footrope Knots and the associated Museum of Knots and Sailors’ Ropework are run by Des Pawson MBE and his wife Liz. Des is one of the world’s leading authorities on knots and sailors’ ropework. A researcher and historian on the subject, he is the author of many books and is available for talks and demonstrations. Footrope Knots, established in 1980, sells a variety of handmade ropework by Des and Liz, as well as the books tools and materials for others to create their own work. Footrope specialises in handmade decorative ropework, from bellropes to fenders, knot boards, keyrings, mats and lanyards. The Museum of Knots and Sailors’ Ropework is open by appointment to those interested in this area of overlooked craftsmanship. Opened in 1996, it is crammed full of interesting items and it is the largest display on the subject in the UK. Such items that have often not been valued or exhibited by museums. The collection includes old and recent ropework and ropeworking tools. There are many interesting examples of the ropemaker’s art.